This recipe comes from Rantings of an Amateur Chef (http://rantingchef.com), a food blog I follow. It’s a breeze to make and sooo good. 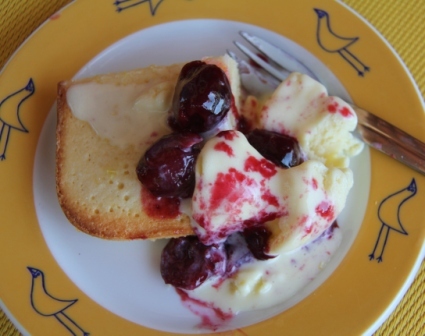 I served it with a scoop of Scaramouche lemon ginger ice cream (www.glaces.scaramouche.com) and cherry compote I had made for another dessert. Three stars.. but the brownies are delicious on their own. Preheat over to 350 degrees F. Grease 8X8 inch baking dish and set aside. Zest and juice three large lemons, set aside. In bowl of electric mixer fitted with paddle attachment, beat flour, sugar, salt, and softened butter until combined. In separate bowl, whisk together eggs, lemon zest, and lemon juice until combined. Pour this into flour mixture and beat for 2 minutes at medium speed until smooth and creamy. Pour into baking dish and bake for 23-25 minutes until golden around edges. Do not overbake or the bars will dry. Allow to cool completely before glazing. Whisk powdered sugar with lemon zest and juice. Spread glaze over brownies with a rubber spatula and let glaze set. Cut into bars and serve. Feel free to comment on this and other recipes.